This list will get bigger over time. Feel free to pose a question. We can always ASK KATE. Question: How many chickens can fit in a Happy Chicken Tractor? Answer: That depends on the size of your chickens. If you agree that each chicken needs three square feet of space, then the answer is 10 chickens. QUESTION: Can I add a Roost or a perch? Answer: No need. The Happy Chicken Tractor comes with a perch included. Your chickens will be happy if they can get a little way off the ground when they want to do so. 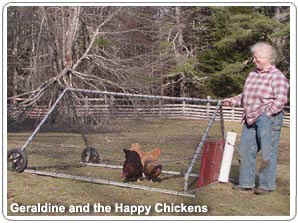 The Happy Chicken Tractory = a Better Solution. Question: Build it or buy it? Answer: Many people prefer to build their own chicken tractor solution and that's just fine with us, but when we thought about it, the idea that, "I can build one of these for $100" just doesn't hold up. Think about it. Building a good sized structure takes time. If you add time to the cost of materials, and the gasoline to go get them, your costs skyrocket. And there is convenience. Will what you build look sharp, be light enough to move easily and assemble in minutes? We think not. Will it come apart easily later on? Most likely not. We agree that anyone with hammer and nails can build a chicken tractor. We also know from experience that The Happy Chicken Tractor TM is a good value when you really think the problem all the way through. A cheap blue tarp and some old pallets in the back yard are still a cheap blue tarp and a bunch of pallets. Heavy is still just Heavy. USED BUILDING MATERIALS = Bad Ugly Coop. 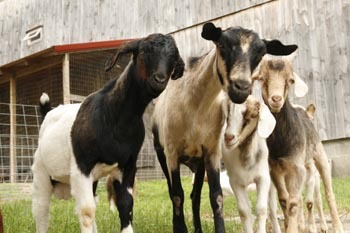 These leghorns deserved a better home so we designed and built it for them. Question: When is Frank Perdue's birthday? Mr. Grumpy, the Boss Birdman, said we need to come up with a better answer about that door thing, so here it is. Better Answer: OK, we added a door. We now include a door and you won't have to go dig a screwdriver out of the socks drawer or wherever you keep them because we figured that part out as well. Wing nuts. Our door is a one-panel wooden door that mounts on the end of the Happy Chicken Tractor. We also sell it separately at The Little Chicken Shop if you need a door for your coop. The Marketing Department calls it the Coop-A-Door-A but they went out for pizza a little while ago so don't worry about that. So. No more door questions, OK? None. Go ask somebody else. That's all. Over and out. Finito already with the door thing, OK? Kaputski. QUESTION: What are the two big nails for? Answer: Some days, the wind blows. 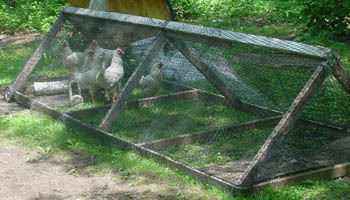 Use the spikes like tent stakes by putting them into the holes provided in the bottom rails to hold the Happy Chicken Tractor in a gale. Or you could just use them for knitting needles. QUESTION: What about a nesting box? Answer: You should feel free to add your own. QUESTION: Why do roosters crow? Answer: We don't have even the foggiest idea; but we found this comment from George on Chickens-101 at Yahoo -- "Crowing Roosters: Most roos start to practice crowing between 10 and 12 weeks and once they start, nothing is going to stop them." Thanks, George. We'll surely tell the neighbors. QUESTION: Can I add water and a feeder? Answer: No need. We include both. Or you can buy our tag-along waterer for some other style coop. It's really pretty neat and only costs $29.95 if you buy it separately. Otherwise, its included.